Dr. Anita Jeyakumar, MD FACS is a Pediatric Otolaryngologist with a strong interest in Pediatric Ear Disease and Pediatric Hearing Loss. She obtained her MD from Meharry Medical College, did her Otolaryngology residency in University of Rochester, and her Pediatric Otolaryngology fellowship at the Cleveland Clinic, Ohio. She has been in practice since 2006. 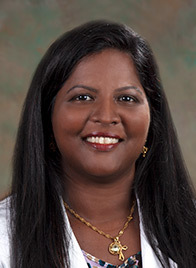 Dr. Jeyakumar was on faculty at Washington University in Saint Louis and Saint Louis University from 2006-2011 where she was actively involved in pediatric cochlear implantation, and was the director of the pediatric cochlear implant team at Saint Louis University from 2009-2011. Dr. Anita Jeyakumar has been actively involved in Resident Medical Education. She won the resident teaching award in 2009 from Washington University and was the Associate Program Director in Saint Louis University from 2009-2011. She is the Assistant Program Director for the Department of Otorhinolaryngology at Louisiana State University-Health Science Center.